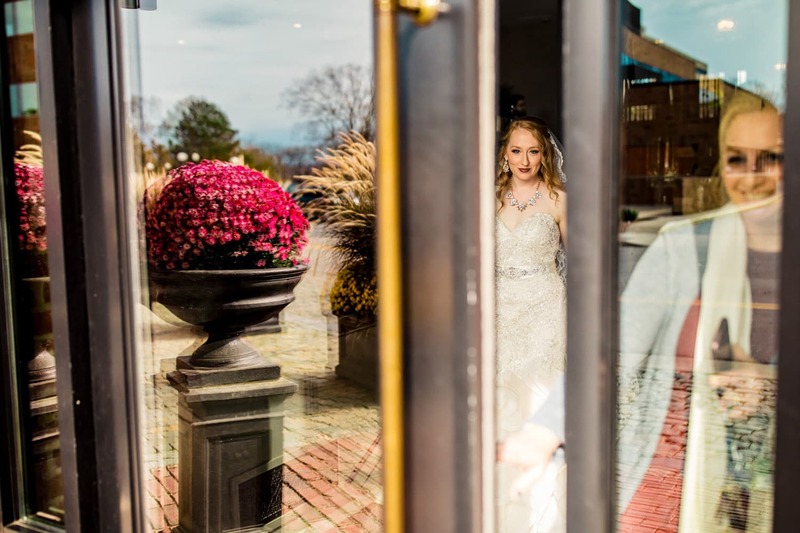 Reflecting back, the thing I admire most about Jaklyn and Tommy’s wedding was their excitement for each detail of their big day. 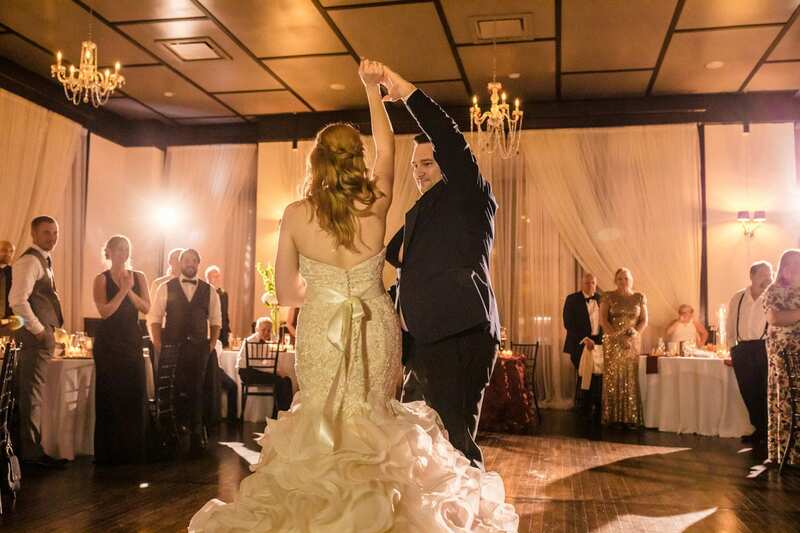 Yes, it was THEIR day, for THEM, but they wanted their guests to feel like it was THEIR day too. 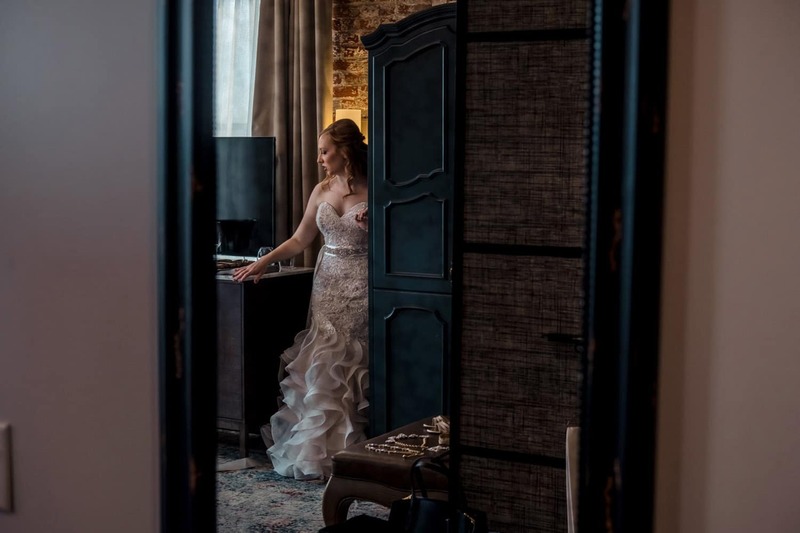 The day started off at The Charmant Hotel in downtown La Crosse, Wisconsin, where Jackie and her sister finished getting ready in a gorgeous boutique hotel room. 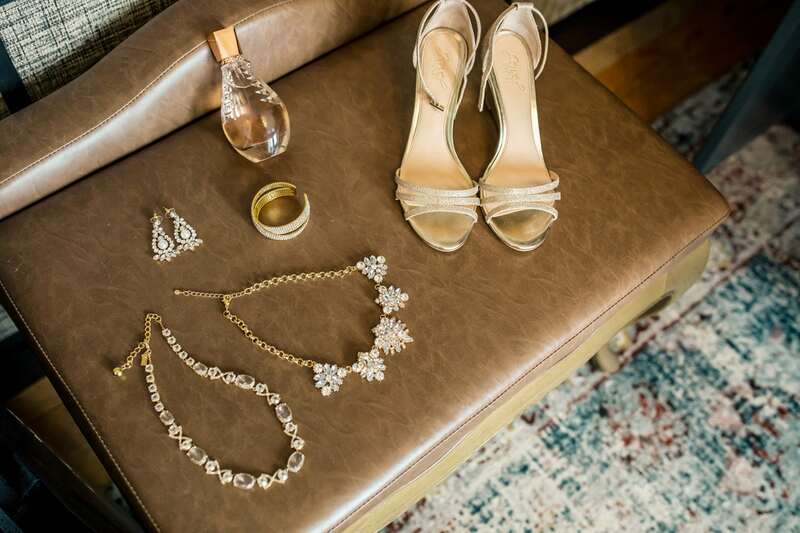 The bride’s elegant gold detailed accessories all coordinated – from her earrings, to her necklace and bracelet, to her shoes. Her strapless, delicately detailed champagne hued gown with cream lace overlay hung from a wooden hanger in the room’s closet, with “Mrs. Drea” written out in gold wiring. 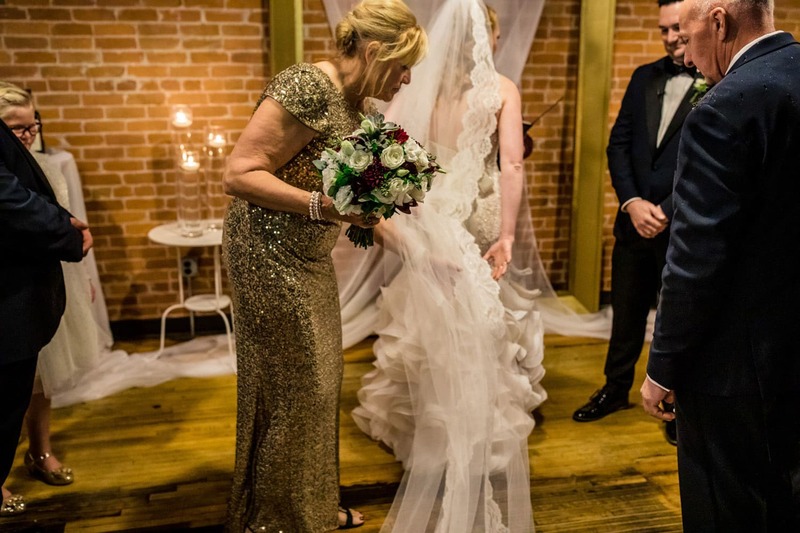 The bride’s sister helped her get into the gown, which had a mermaid shape with ruffled fabric accents near the bottom, was paired with a cream ribbon belt with gold and diamond detailing in the front. Jackie’s red wine colored lipstick effortlessly matched the color of her sister’s long dress. 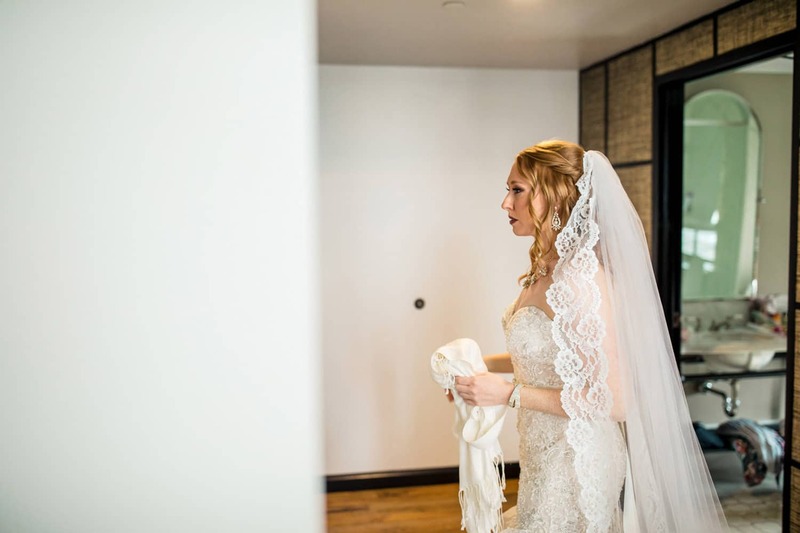 The finishing touch – a delicate lace veil pinned to the back of Jackie’s half up-do, her beautiful red hair loosely curled. Tommy looked dapper in his jet black pant suit, white dress shirt, black suspenders and black satin bow tie combination, complete with a dark teal suit jacket with black satin lapel. 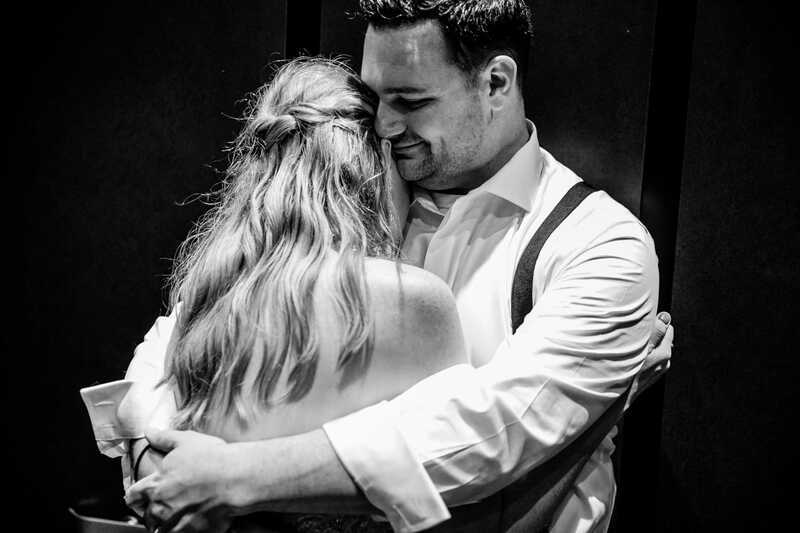 Grinning from ear to ear, he was eager to see his soon to be wife. 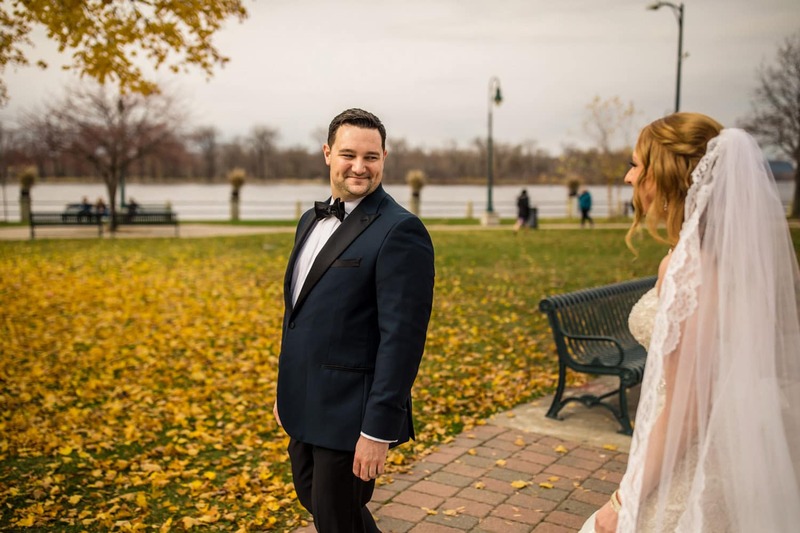 He made his way down to Riverside Park, near the Mighty Mississippi River, where he would get a first look at Jaklyn on their wedding day. 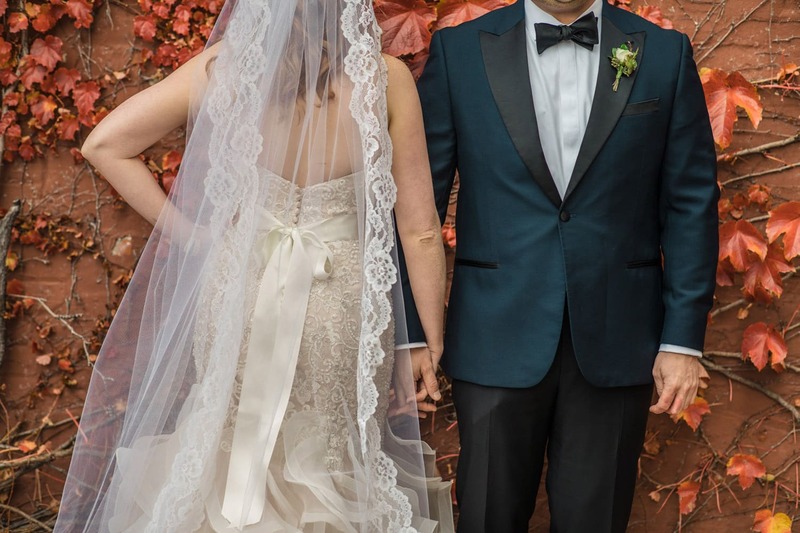 The late fall golden leaves fallen from the trees made for an eye catching background as the couple shared their first look, admiring each other and embracing for a kiss. 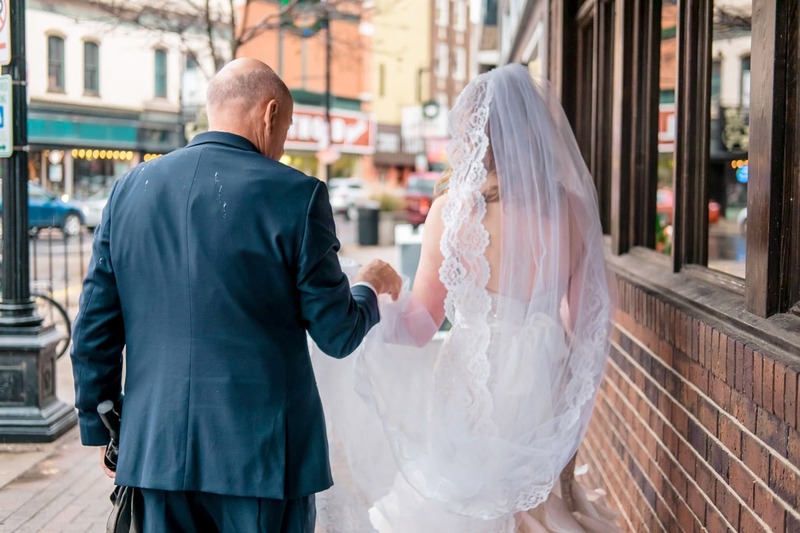 The duo joined their families at The Court Above Main in downtown La Crosse, where their reception would later take place, to take some pre-ceremony family pictures. The venue was set up to Jackie and Tommy’s likings, ready for the big celebration. 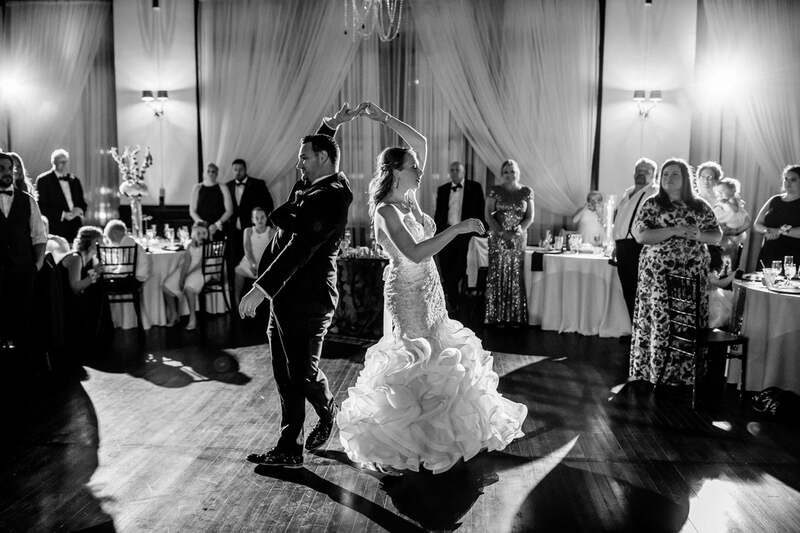 The couple, who enjoys traveling, had dinner tables decorated with adorable tiny suitcase and globe trinkets. Their wedding cake, made by Meringue Bakery, was a circular white cake with gold map detailing, sitting atop a French macaroon tower (macaroons also made by Meringue). 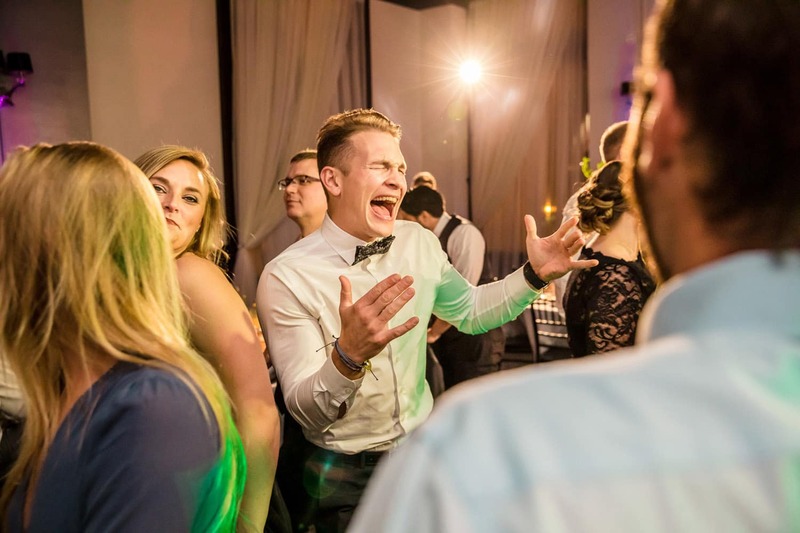 Jackie and Tommy mentioned their sweet tooths, but when we saw the dessert TABLES, yes, more than one…FULL OF CANDY & DESSERTS…we believed them! They had everything you could want, from suckers to taffy, Reeses to Twix, to Skittles to M&Ms to Ring Pops, to cupcakes to cheesecakes to cookies. It was the most impressive display of desserts I have ever seen. 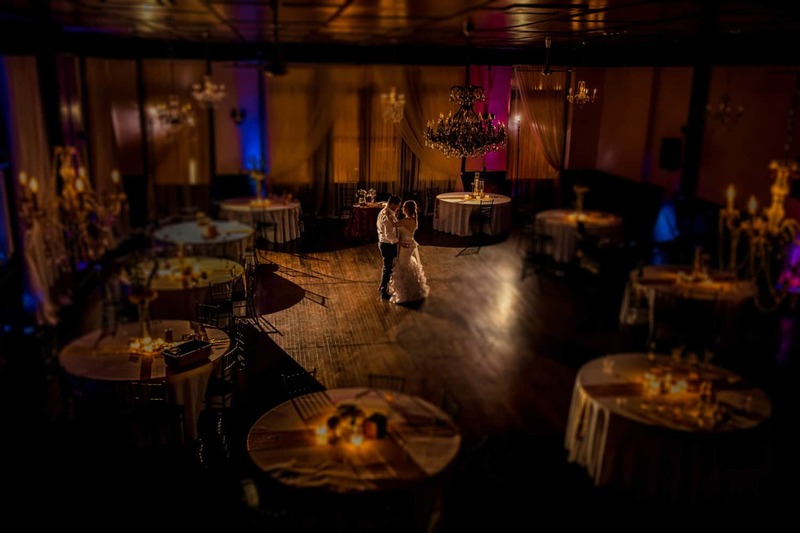 Later on, we’d watch as guest’s eyes widened as they laid eyes on the amazing tables. Tommy and Jackie explained, “Desserts are our thing. If we want something sweet, we’ll make cookie dough and eat it.”, but…they could not decide on what kind of sweets to have at their wedding…so they just got everything. What crowd pleasers! 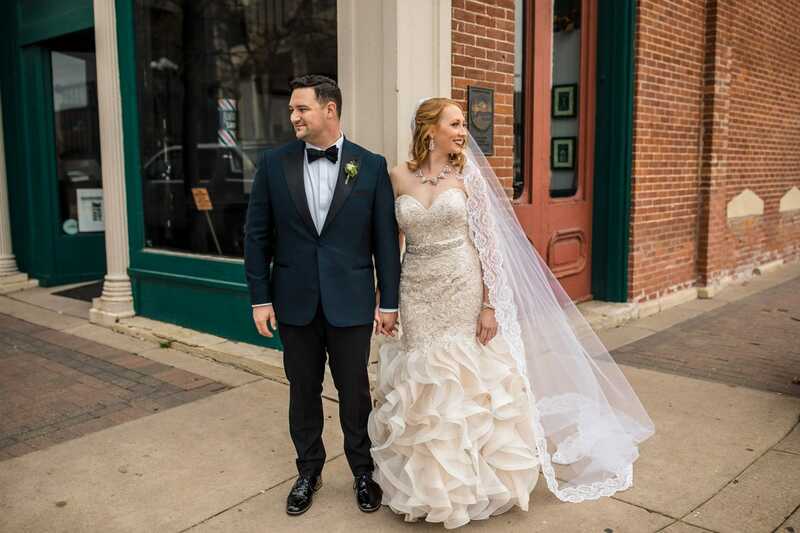 The couple are self described “Vinos”, so it was perfectly fitting that their intimate wedding ceremony took place at 4 Sister’s 4th Street Wine Bar, down a few blocks from The Court Above Main. (See what I mean about the details?! 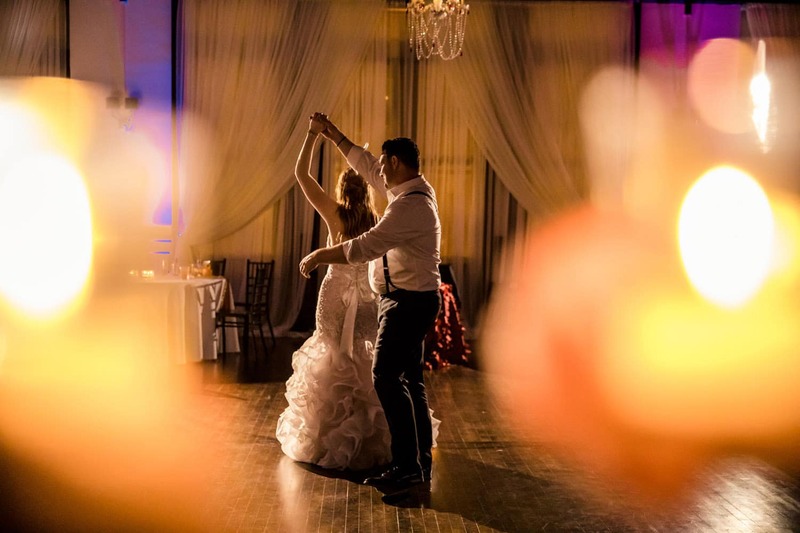 Perfectly suited towards them as a couple, but also SO fun for guests!) Guests were arriving there dressed to the nines, sipping on a wide variety of quality wines offered at the unique bar, waiting for the ceremony to begin. 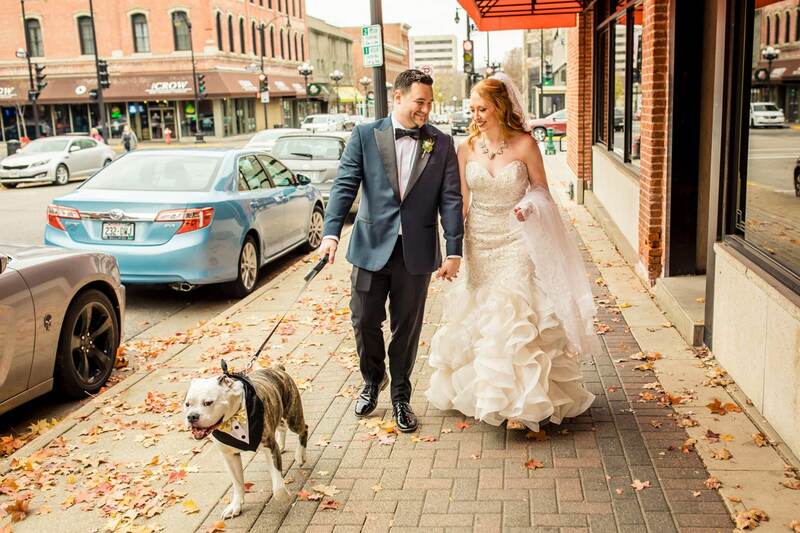 Tommy and Jackie took some time to quickly walk their beloved doggo, named Charlie, who was donning a dog tuxedo bandana around his collar. 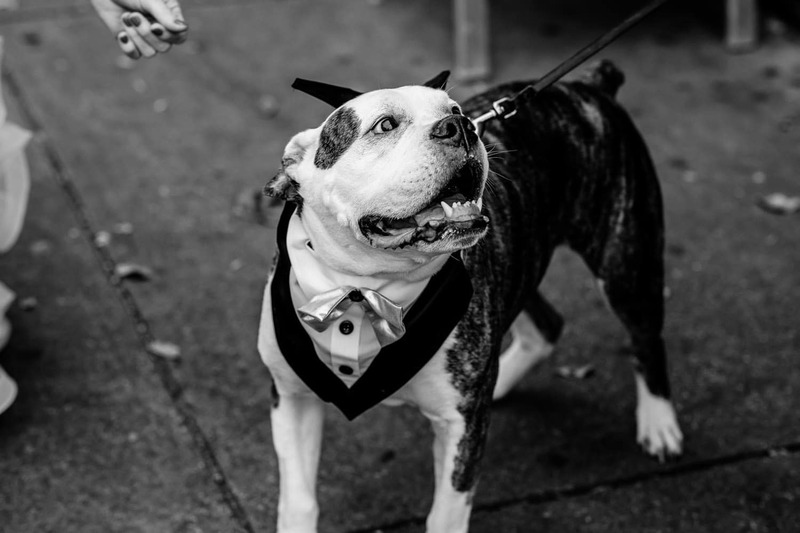 During the ceremony, the Officiant did a reading on “how love is like owning dog” with the help of the couple’s nieces and nephews, that had guests smiling and chuckling. 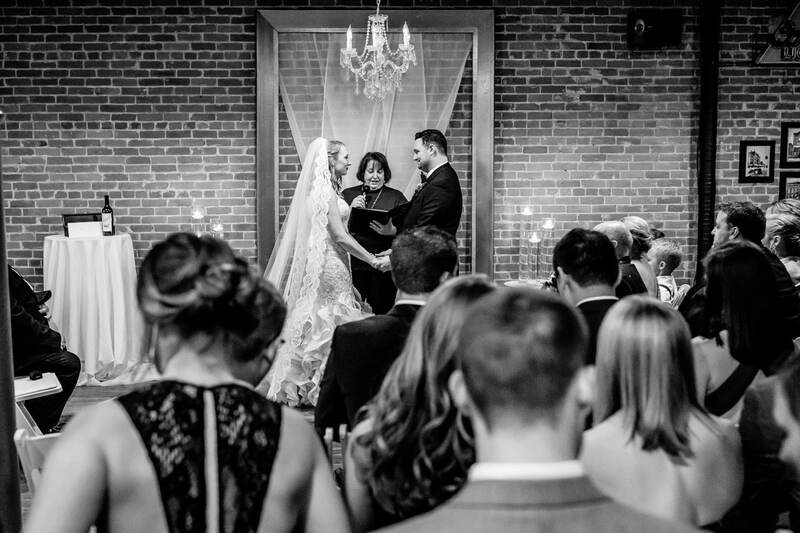 The couple stood in front of a large gold rectangular frame, leaning on the exposed brick wall of the 4th Street Bar, a white tulle material flowing from the frame, and an eye catching gold chandelier hanging from the ceiling above the two. 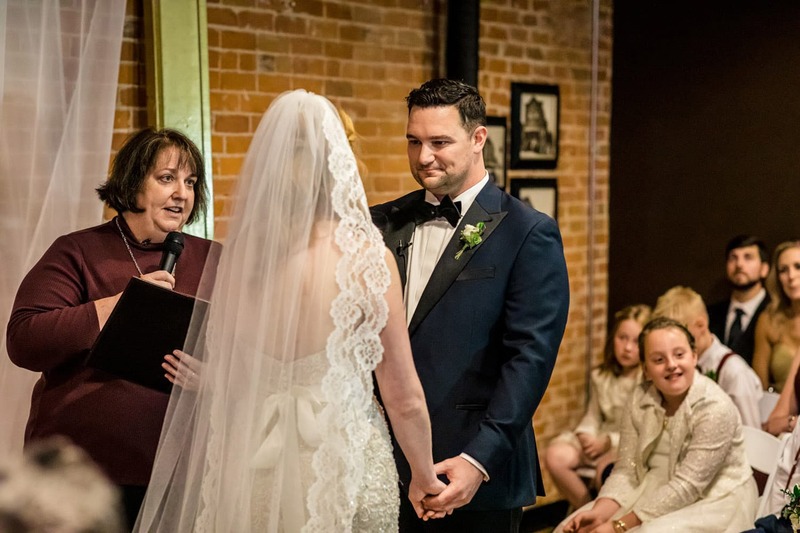 A wooden box with a bottle of wine to commemorate their wedding day was presented during the ceremony, and the Officiant explained that both the couple’s parents had written letters that were to be sealed in the box with the wine, which was to be opened on their 5th wedding anniversary. 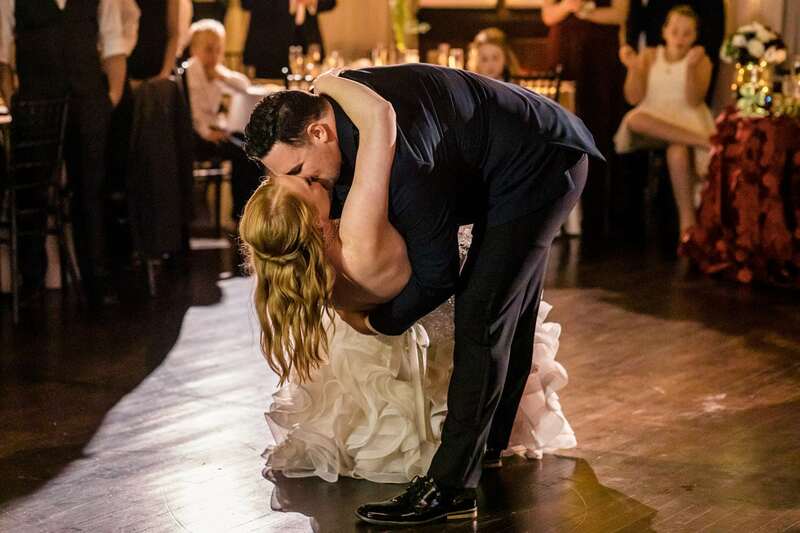 After sharing some personal vows fueled with emotion, Tommy and Jaklyn were pronounced husband and wife, and they shared their first kiss as a married couple. 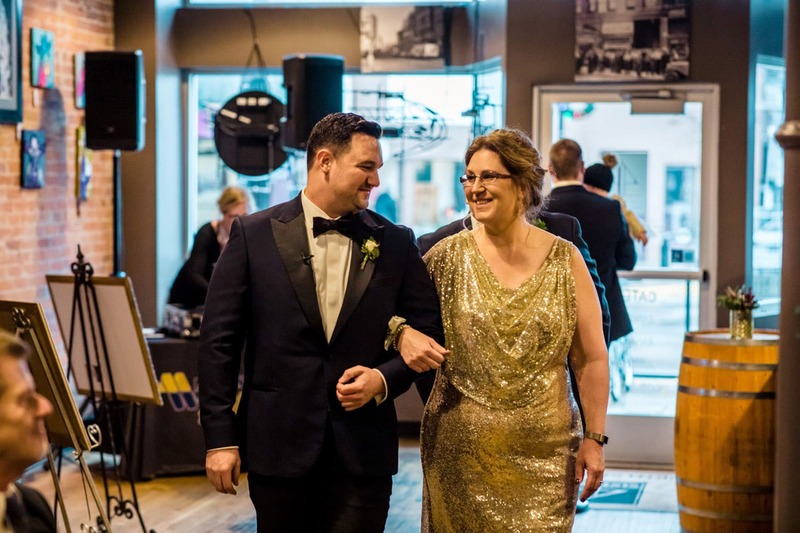 There was no need for a “formal” receiving line, as they kept the guest list small and were able to quickly turn around after walking down the aisle and greet their loved ones. After some time enjoying the environment at the 4th Street Bar, everyone headed to The Court Above Main for the Cocktail Hour. Among many other options, the bar was serving a “Lavendar French 75”, made by the bride herself (and Boxcar team approved)! The newlyweds snuck outside briefly for some solo photos, as guests mingled and enjoyed starters being served by the caterer, The Damn Tasty. Offerings included grilled chicken banh mi sliders, candied bacon lollipops, BLT bruschetta, and roasted tomato caprese bruschetta. All mouthwatering. Table placeholders were teeny tiny luggage boxes made out of cardboard, with each guests name on them. 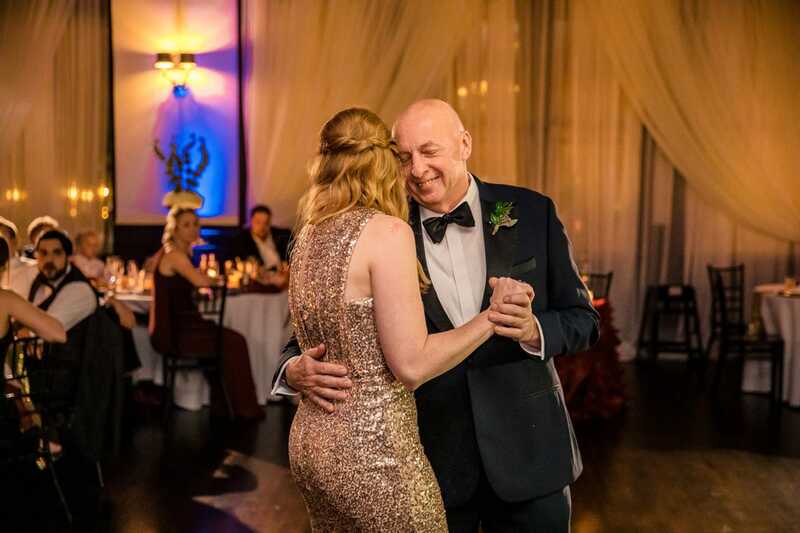 Pictures of loved ones who had passed were framed and placed throughout the cocktail area. When the dining room was opened for guests, there was a crowd around the dessert table from the get-go. (Who could blame them?! We got early access, enjoying some candy as a “snack” and “pre-appetizer”.) 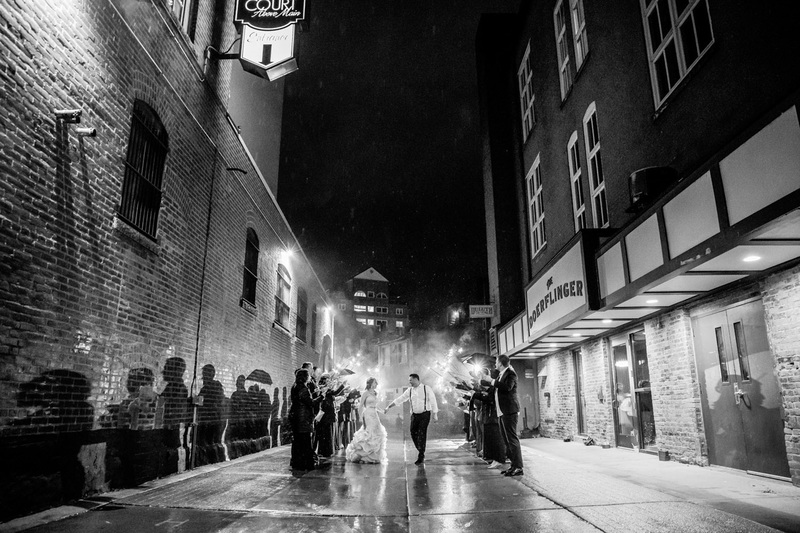 Little did they know, later the couple would bust out “To-Go” boxes for guests to fill with candy to take home! Dinner was served by The Damn Tasty, including a pear and gorgonzola salad, and entre offerings including southern buttermilk braised chicken, short rib provencal, apricot glazed bacon wrapped cajun pork tenderloin and butternut squash lasagna. Unique options, but after spending some time with the duo, no surprise for this generous couple! 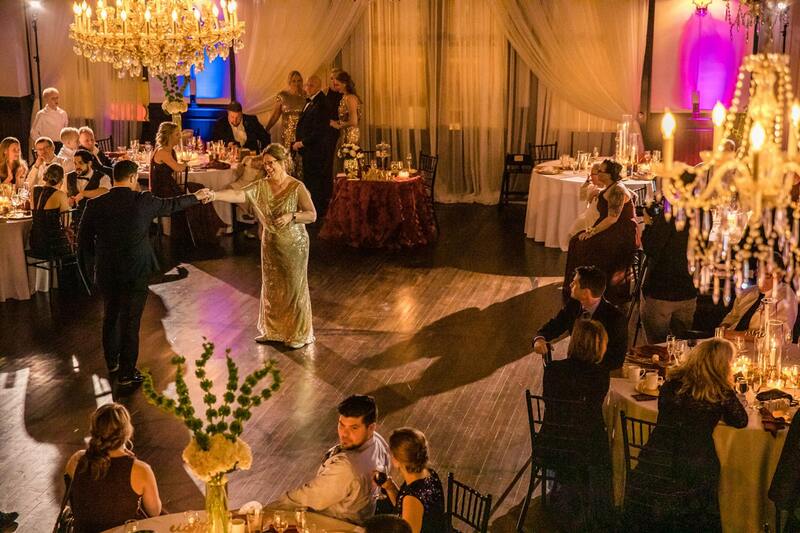 After the toasts and first dances were over, all the guests hit the dance floor with vivacious energy. Friends from high school, grad school, and everywhere in between gathered for group photos. 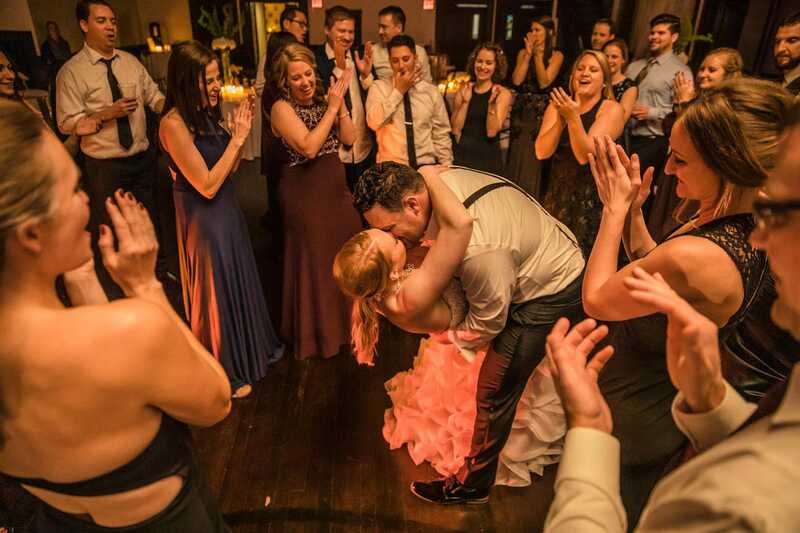 Tommy and Jackie told us at one point in the evening that after 15 months of planning, everything on their big day went better than planned. While that’s great to hear, it was even better to witness! 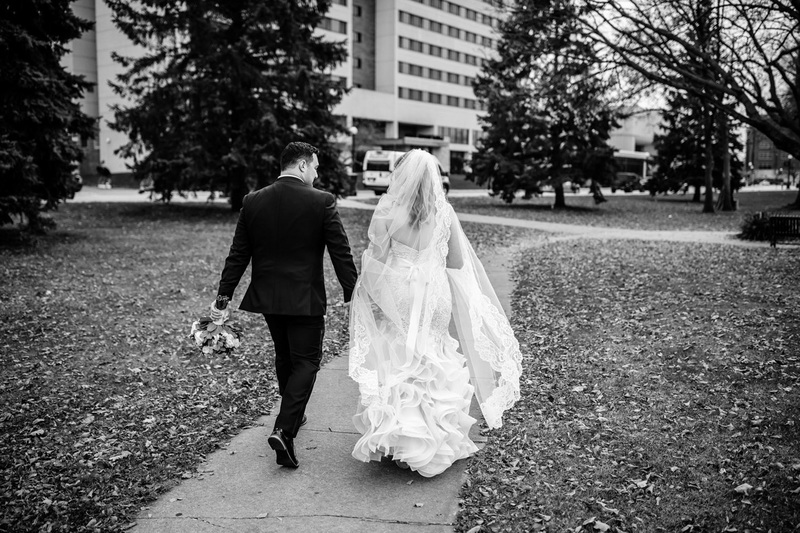 They had an ease about them throughout that day that made it clear that they would truly cherish this day, and each moment of it, for the rest of their lives. 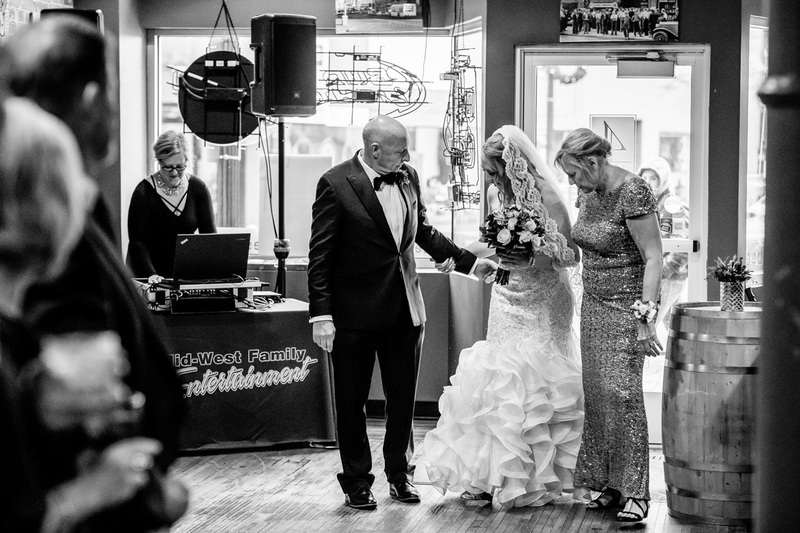 They were present, in tune with each other and aware of all the love surrounding them on their wedding day. 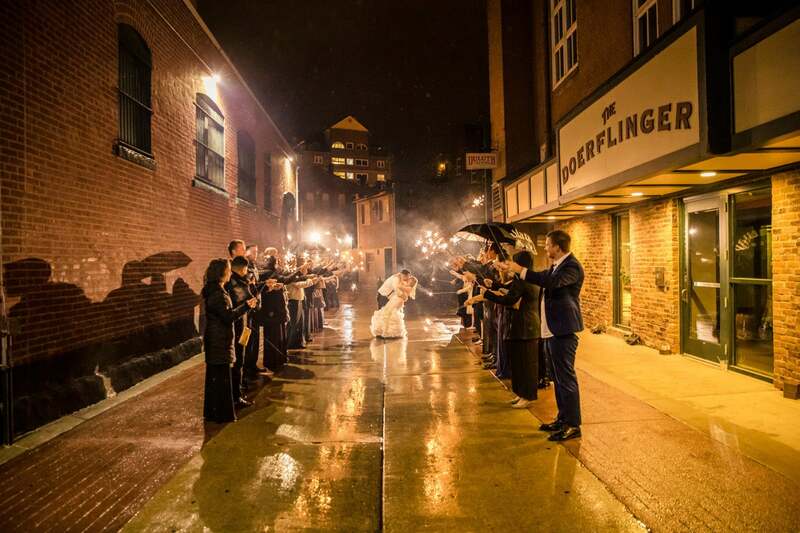 Tommy and Jackie planned a sparkler send off in the Doerflinger Alley behind The Court Above Main at the end of the evening, but they also planned a “last last dance”. 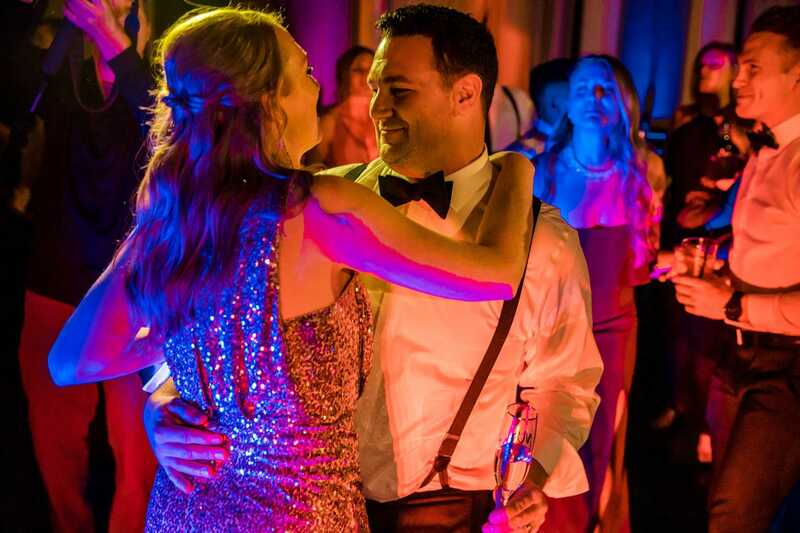 While guests were headed out to the alley with their sparklers in tow, the newlyweds stayed behind on the dancefloor with Ben, and shared an intimate final dance together – just the two of them. 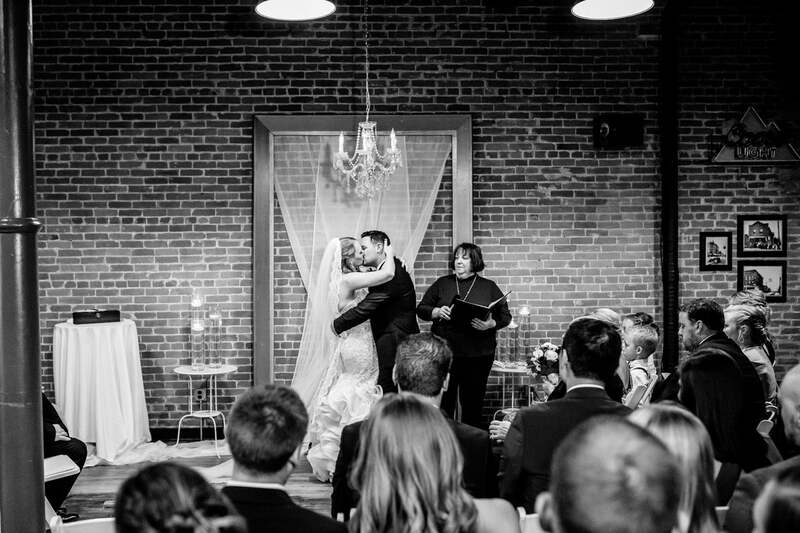 This was another example of how they made it a priority to ensure that the moments they had together were special. 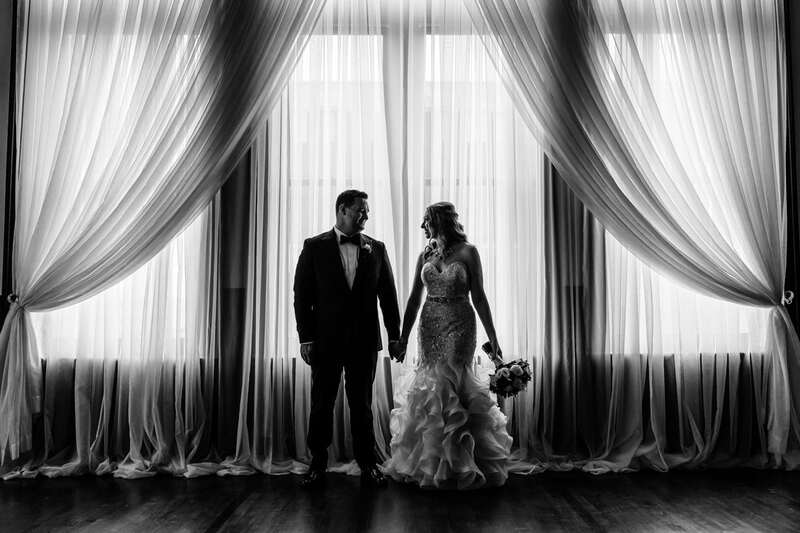 It made for breathtaking photos, but more importantly – it was authentically them. 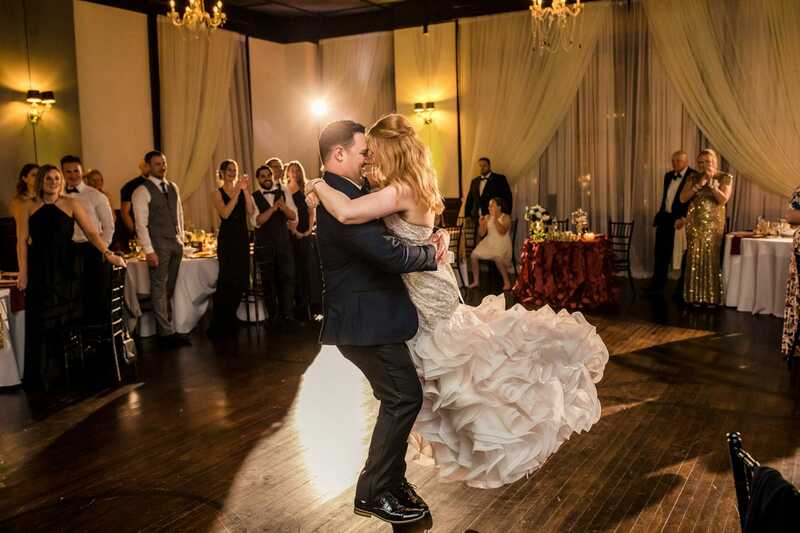 Thank you both for being so fiercely “you”, and for letting us be a part of your wedding day.